JWH Living is a company with a sole vision, and a sincere promise: to produce modern bathroom furniture that not only represents the pinnacle of high-concept style, but also promotes the ideal of bathroom vanities and other furnishings being convenient, functional, and affordable enough for everyone, regardless of the size or design of their bathroom. So check out our catalog, and experience firsthand the JWH difference! 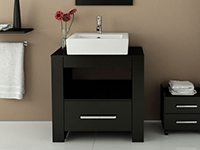 At JWH Living, we take great pride in our unique collection of high-quality and innovative bathroom vanity designs for any variety of commercial and residential applications. 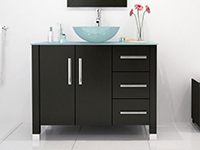 Whether you are remodeling your bathroom or upgrading your modern office boudoir, we have the perfect contemporary vanity for you. And we tirelessly stand by our belief that all of our products embody the utmost ideals of beauty, functionality, and durability in the broad field of contemporary bathroom design. 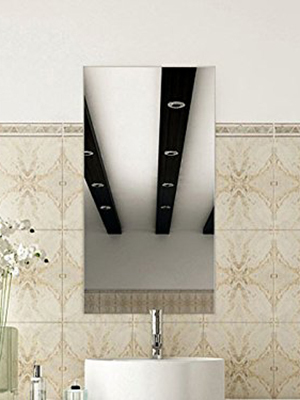 Our company was created with one driving purpose in mind: to provide consumers with the finest, most visually-compelling modern bathroom cabinets on the market. We design real products for real people, and all of the vanities we offer are guaranteed to look as brilliant in your home as they do on our website. We have developed our signature high-style aesthetic through a blend of synthetic and natural materials that are both sturdy and aesthetically relevant. 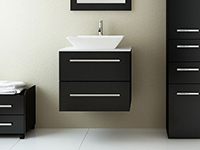 We strive to design bathroom vanity collections that are modern in design, yet timeless in character. But appearances alone do not make great modern vanities. Modern bathroom cabinets must also be highly functional, and that is why JWH Living' bathroom vanities are engineered to last a lifetime. The materials used to construct each piece require minimal-to-no maintenance and care, and our designs are highly space conscious and efficient without sacrificing any degree of comfort or style. Our double vanities optimize the amount of space they fill to accommodate multiple users without encroaching on the room, and our small, single bathroom vanities are a fine fit even in the slimmest of guestrooms. To further improve the utility and innovation of our vanity cabinets, we have meticulously simplified their design for easy installation. And to top it off, all of our products are manufactured using the most eco-friendly methods in their class. We commit ourselves to making only the sturdiest product on the market that is built to last for years and years to come. Our modern vanities are well equipped to resist fading and cracking, and the tempered glass is designed to be very strong. The wood materials can be natural reclaimed oak or MDF composite, for degrees of quality, weight, and durability to suit your standards. The vanities are then sealed and finished to resist mildew and warping caused by excessive moisture and humidity. This advanced blend of materials allows us to create furniture that's truly built to last a lifetime. 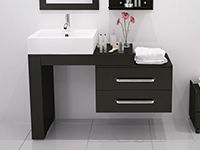 So please, peruse our catalog of incredible vanities you won't find anywhere else. All of our products are gorgeous, sustainable, functional, and are built with you in mind. Enjoy your stay.